Last month, college student Josh Goldberg launched a new project which allowed gamers to play the full Super Mario Bros. game directly in their Internet browsers. “Full Screen Mario” also included randomly generated levels as well as a level editor. Unfortunately, the website has since been shut down. Nintendo determined the page to be a violation of its IP. FullScreenMario.com has been found in violation of the Digital Millennium Copyright Act (DMCA), and on Friday, November 1st was taken down by an official DMCA complaint from Nintendo. 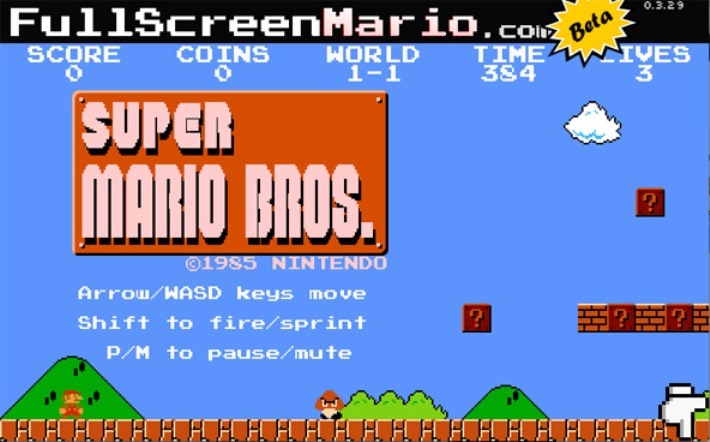 The website allowed players to play an open source HTML5 remake of Nintendo’s 1985 Super Mario Bros, containing the original 32 levels, a random map generator, and level editor. This was in violation of Nintendo’s copyrights and trademarks. Full Screen Mario was enjoyed by nearly 2.7 million unique visitors during almost a month of popularity, across 6 continents and dozens of languages. I’m glad so many people got to enjoy the game, and look forward to working on new and exciting (and legal) projects.